To me, theoretically at least, Christmas is all about family traditions. Unfortunately, I didn’t have a big family, nor did we have a lot of traditions. I was an only child and so was my mother, while my father’s family lived in far-away Winnipeg, so we seldom saw them. When I was little, we lived in southwestern Ontario. Every year, we took the overnight train to Montreal to spend the holidays with my mother’s parents. They were a quiet, elderly couple even when I was a child, and Christmas dinner was a rather formal event, although things livened up when everyone opened their Christmas crackers and put on the silly paper hats that came inside. What I loved best was the skating rink scene that decorated the dining table. (Don’t ask me where we ate if the scene took up half the table; I don’t remember.) It was made with cotton wool snow, a mirror transformed into a skating rink, a plastic church on a hill of cardboard boxes, and tiny skaters and children sledding. I thought it was amazing that the street lights around the rink, originally from a toy train set, actually lit up, and I loved to ask my grandfather to wind up the music box movement inside the church so we could hear its tinny version of Ave Maria. I especially liked to look at the figurines, and to pick them up and put them down again. I was probably about six when this was taken with my mother, grandfather and grandmother. 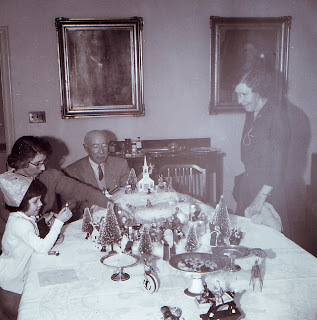 After my grandparents died, my parents carried on the tradition of assembling the scene every year. By that time we lived in Montreal, and my mother enjoyed showing it to the children of her friends and extended family, and eventually to my children. The scene evolved over the years. New porcelain animals and a Scandinavian-style wooden Mary and Joseph joined the antique crèche figures in front of the church, and modern reproductions replaced some broken snow babies. It seemed to me, however, that the new figurines were never as nice as the originals, even if they didn’t fall over as often. For the past 10 years, I haven’t put out the skating rink scene. The cat likes to curl up in the cotton wool, and I am afraid she’ll break something. But some day I’ll get it out again, perhaps to charm another generation. Have a lovely holiday, everyone. I will be back with more stories in the New Year.